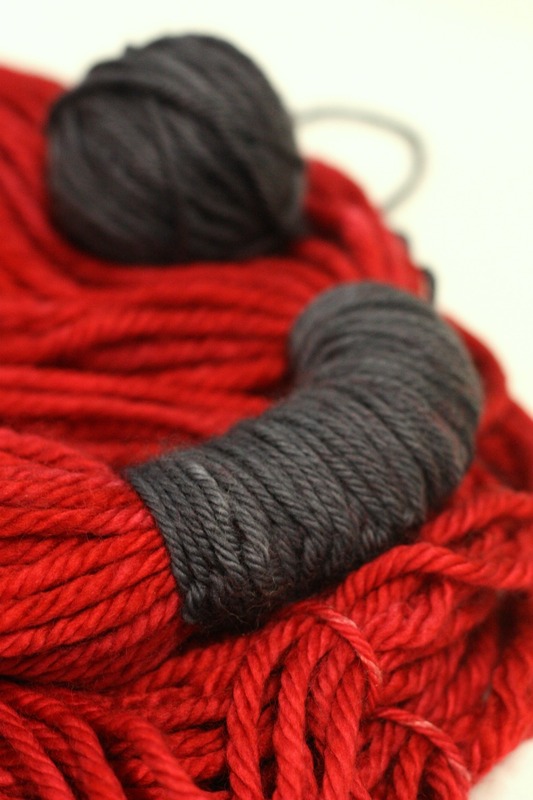 Welcome to the shiny new blog for frabjous fibers and Wonderland Yarns! We know it’s not quite Halloween, but don’t get upset if we remind you that it’s never too early to start preparing for the holiday season. If you’re short on time, or have a long list of giftees, and love the Wonderland Yarn colors as much as we love dyeing them, the neck wrap pictured above requires a mere twenty minutes, one skein of TweedleDeeDum bulky, and a coordinating scrap yarn from your stash. Ditch the needles and hook. 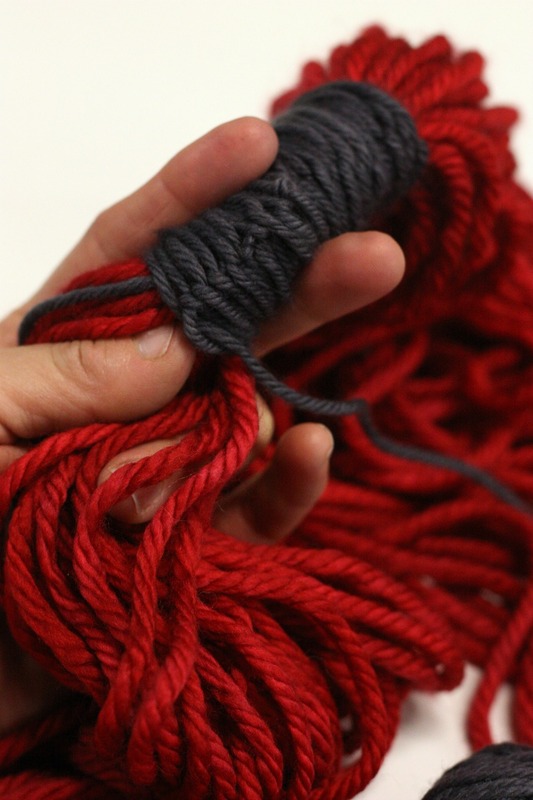 Lay your skein out on a table and locate the two places where it’s tied to keep it tidy. Starting at one of these points, make a slip knot with your coordinating waste yarn (we used leftovers of our March Hare worsted) around all the strands. It’s easiest to do this with the waste yarn wound into a ball. Continue making slip knots, one after the other, until you have a 4-ish inch band around the bulky yarn, covering the place where it’s tied. Repeat for the second tied place. Weave in the ends by drawing them under the band with a darning needle, and boom! 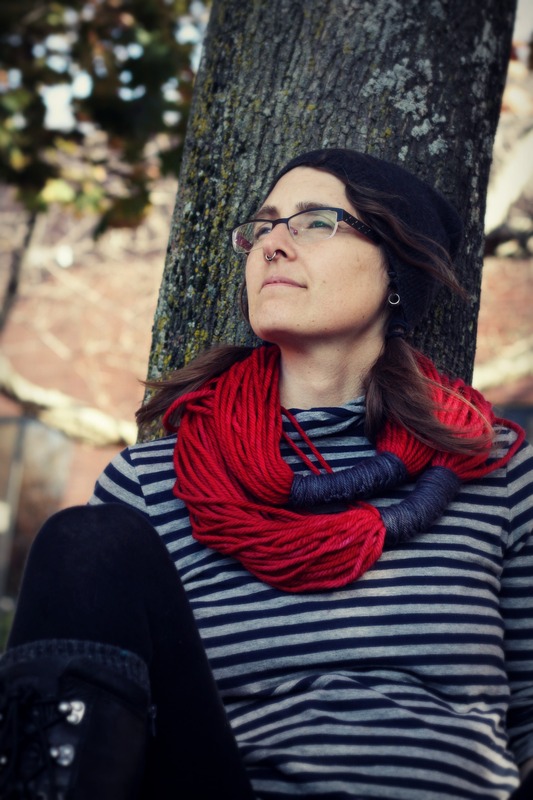 Squishy-soft wearable yarn love achieved! Pick a color for every friend (and one for yourself, too). Enjoy, and FYI: we have a new Ravelry group for sharing projects and ideas. We hope you’ll join us there and show us your favorite projects with Wonderland Yarns. We’ll also share project ideas here, studio stories, frabjous employee profiles, and other surprises, so stay tuned! Share your projects on Ravelry! Back on track – Virtual Road Trip 8th Stop: The Woolery! Dashing in to Yarn It & Haberdashery! In Case of Yarn Emergency, call Fiberworks! Charmaine Taylor on A Rainbow-licious Giveaway! Elsa L. on A Rainbow-licious Giveaway! Mayra M on A Rainbow-licious Giveaway! Karen Collins on A Rainbow-licious Giveaway!